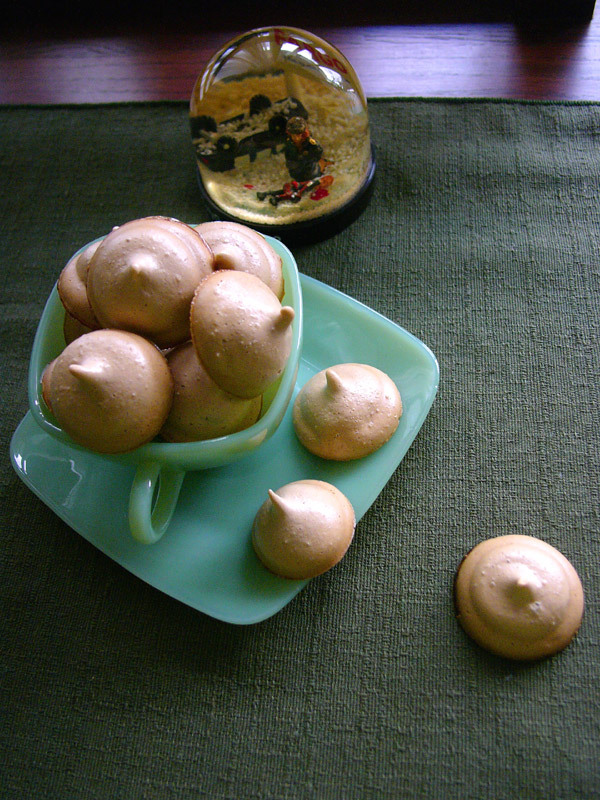 the scent of green bananas: coffee meringues. Posted by santos. This entry was posted on 20061129 at 1:54 AM You can skip to the end and leave a response. This recipe is so perfectly timed! My bf is going to make creme brule for 10 this Friday, and I was just thinking what to make with all those egg whites I'll 'inherit' :) Coffee meringues sound like a perfect solution! Those look very yummy. It is muggy and warm here today and I wonder if they would live long. Y'know how in Proust when he eats a madeline and reminisces, well these just reminded me of unko hats. acornbud, sadly, not long, i think. but they'll still be tasty! toni, that's exactly what happened! Someday I'll explain, but not now.